Love to read books and curious how fast you can read? Well, take this speed reading challenge that'll measure just how fast you can read, tell you exactly how long it'll take to read some popular classics, and compare you with national reading speed averages. It'll even tell you how many consecutive eBooks you can read before your eReader's battery will die (Nook, Kindle, Kindle Fire, Sony Reader, etc.). Though I'm not sure how many people would read multiple books all in the same day causing them to kill their eReader's battery. I suspect even prolific readers wouldn't read more than 2-3 books per day. Staples released this benchmark reading tool in honor of 'Read an eBook Week' (March 4th-10th). If you want to know how long it'll take you to read classics like The Lord of the Rings or War and Peace or more contemporary books like Harry Potter & The Sorcerer's Stone then this is the tool for you. 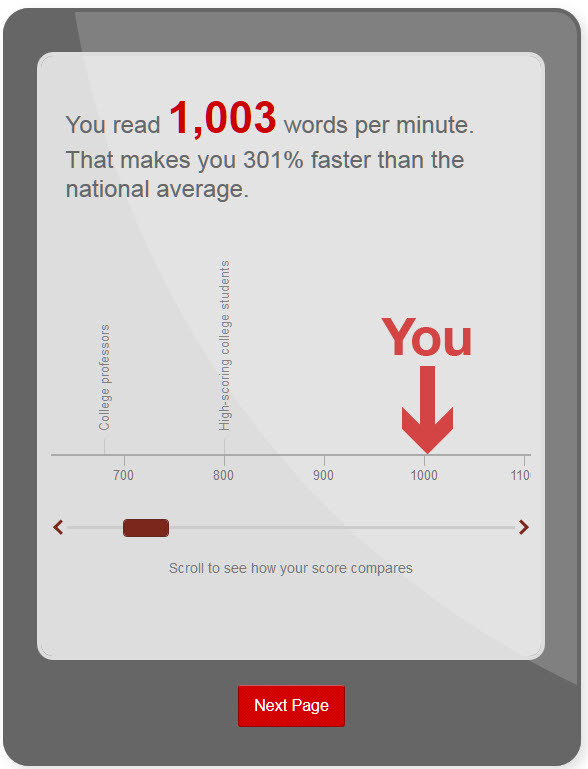 The results will also enable to you to compare your reading speed against the national average.